EvoDrene is a 100% natural potent pre workout supplement that provides you with everything you need to take each workout to the next level. Our formula uses only the most effective and natural products on the market. Taken 30 minutes before your trip to the gym will cause EvoDrene to help you get the most out of each and every workout. Supplements and Nutrition for a successful training The positive effect of pre-workout nutrition is famous in the fitness and Bodybuilding increasing popularity. What does the term "Pre-Workout Supplement"? Under the pre-workout nutrition is generally understood that nutrition and supplements that are taken prior to exercise and thus instrumental in the success and the intensity of the training involved. How do I make my meal before training best suited for consultative? The pre-workout meal should consist of easily digestible protein source, such as low-fat dairy products, lean meat or egg white. Protein is particularly important at this time to prevent catabolic processes during training. Moderate to low GI carbohydrates fill the energy storage and keep the energy level maintained during the entire training. Recommended here are for example Whole grains, oatmeal, rice or noodles. To ensure a high Testosterone during training, ensure that a moderate intake of essential fatty acids in the meal before exercising. What are the pre-workout supplements are available? There are a number of excellent and award-winning pre-workout supplements. - These products provide an improved oxygen transport and increased nitrogen balance. And pumping intensity increases significantly during the training Caffeine - For those after a long hard day at work and not quite so fresh. L-Arginine - This amino acid also improves blood circulation and Glycogen. Workout Boosters - These supplements contain various compounds such as caffeine, amino acids, including taurine We are often asked which is pre-workout supplements are best. Since each body reacts differently to supplements, but it is very difficult here to give a general recommendation. Experiment with different products and see you, we will respond your body with respect to an increase in performance, muscle pumping and exercise intensity. 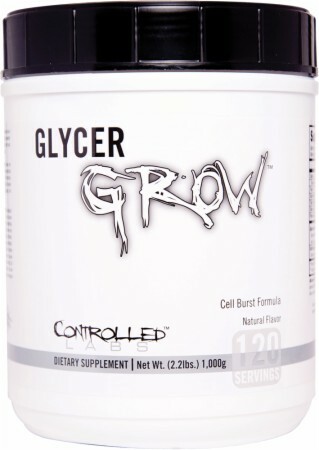 GlycerGrow by Controlled Labs is pre-and intra-workout supplement is longer at high temperatures (above 25 degrees) the water in the muscle stores. Especially triathletes glycerol use in the Isodrinks with a mixing ratio of 1/5 to 1/10.Der advantage in the dehydrogenation of sport would hardly takes place. Glycerol is a fat binds to the water from the air. Disadvantage in endurance sports is a slight increase in weight. Bodybuilding are possible slight increase in mass by the force of better services, transport of nutrients and an increased pumping. A little salt enhances the effect enormously. A disadvantage is that stearic acid in glycerol is a saturated fat and has lots of calories. The fact is that stearic acid has no influence on cholesterol levels has, but a lot of calories. One should take into account the amounts of carbohydrate to be adapted. Very important to note after exercise is to drink enough, because the activity of the glycerol and the body excretes more water. The body is without water after a workout quickly into a state of dehydration. Effect The effect is extreme for me! With a bit of salt the body stores more water to greet the Michelin man leaves. Increase endurance and strength are clearly evident. But there are more 1-3 repetitions. With glycerol and Saltin diet, I was able to increase my performance in competitions earlier in the short term by 10-15 percent. It is evident that the body retains water. Taking 3 Scoops in 1 liter of water. Before training the rest to drink half of your workout. Taste The flavor is neutral. Performance The 1000g with 3 scoops per day of practice has 40 days. The price is on average around 23 $. $ 0.57 per day of training that is what is acceptable. Ingredients Ingredients Glycerol monostearate, taurine, salt and potassium. And 18 grams of fat at 3 scoops. Solubility Moderately / 3 scoop in a shaker and shake well then form flakes which disturb but no further. Side effects No (but only if you drink a lot during and after training) Conclusion At high temperatures the ideal pre-and intra-workout supplement that can be packed and for the price you can not complain. A product with three simple ingredients with tremendous effect. For short-term thermal regulation, nutrient transport and cell volume, an excellent product. Driven Sports Craze in our opinion is the best pre-workout supplement 2012! Explanation about the ingredients Craze can from the inside - powder and spoon Before we discuss the ingredients should be mentioned that a lot of effort-driven sport has been to investigate the optimum composition. Each ingredient and its effect is occupied by several studies. Lists a total of Driven Sports 41 studies that demonstrate the effect of all ingredients. No other manufacturer can demonstrate an intense research, not even the very big. There is no contain arginine Unlike many other manufacturers Driven Sports has put no arginine Craze for one simple reason: arginine is not a pumping element! This statement is of course occupied with studies. Supplements such as N.O. Xplode, Jack3d, 1MR and many others contain arginine - which shows that manufacturers are not careful and really easy to throw together ingredients in the hope that it works. Craze contains NO Geranium extract / DMAA / 1,3-dimethylamylamine 1.3 dimethylamylamine also known as geranium or DMAA is now making the rounds in the media and supplement forums. It is reported by numerous side effects. The highlight is of two U.S. soldiers reported dead whose deaths may be geranium. USP Labs has published a dedicated website dmaaresearch.com against criticism by listing only benefits of Geranium but everyone can think for themselves, that they want to save only their geranium-filled supplements before the doom. Craze does NOT contain geranium. L-citrulline Rather than attach arginine is used in Craze citrulline. Citrulline is proven to increase the synthesis of arginine, thus ensuring more nitric oxide in the blood, in other words, more pumping. To improve the above-mentioned effect has yet Craze ascorbic acid (vitamin C) because it was shown in studies that it improves the nitric oxide production and also leads to less muscle soreness and improved recovery. Creatine This must be said, not much. Pretty much everyone knows creatine and I know that it increases muscle growth and strength. Creatine is one of the safest supplements whose action is no longer disputed, as there is enough evidence for the effect. Of course, it is therefore used in craze in the form of creatine monohydrate. Trimethylglycine / Betaine Anhydrous The material contained in Craze Trimethylglycine (TMG) Betaine Anhydrous, or is a natural osmolyte that increases exercise performance and reduces fatigue. It also makes the muscles look like bulky due to the improved water transportation to the muscles. Dendrobium extract (Dendrobine,Dendroxine, Dendramine, B-Phenylethylamine, N, N-dimethyl-B-Phenylethylamince, and N, N-diethyl-B-Phenylethylamine) Dendrobium is a plant and belongs to the family of orchids. In China, it is one of the 50 "fundamental herbs" of traditional Chinese medicine where it is drunk as tea. The alkaloid extract of Dendrobium's have interesting effects. To put it short, pain-free and euphoric mood, "you forget" the physical work - also known as "runners high" feeling. Citramine ™ Citramine hiding behind an extract of tangerine. In Chinese tradition, this drug has long been known and is used to increase physical energy. In the extract, the alkaloids are N-methyl (NMT) and contain naringenin reduce fat storage and have stimulating properties. They also increase the stimulant effects of caffeine, where we already arrive at the next and final ingredient: Caffeine Everyone knows caffeine, mainly coffee. Many are not aware, however, that caffeine has very excellent effects. Caffeine enhances the mind-muscle connection, increasing the stimulation, increases performance, delays fatigue, increases the perception of sensation, and improves motor skills. Caffeine is often underestimated but it is an important supplement that should be in every pre-workout composition. Experience and effect Driven Sports Craze box Our team was very self Jack3d fan since the very beginning. As Jack3d has not even been sold in Germany, we were already a few empty cans and wrote the first German Experience Report (Supplement to Guide). In various portals we read statements such as "counter-Craze Jack3d and you can throw the other stuff in the trash." A quick search on the Internet revealed that craze in America has been taken as a bomb or Jack3d 1MR completely in the shade. Sounded exciting, so we have several cans Craze on the German side www.craze-drivensports.de (very recommended way - the best support, fast delivery and good price) ordered and tested for a month with 9 experienced bodybuilders. Taking The box is slightly smaller than that of Jack3d, it looks very high quality and the design is very good. The spoon in the can is the same as Jack3d. In general, we have taken 20-45min before training 1-2 tablespoons Craze with 200-300ml of water. We have always respected the fact Craze not to take too soon before bedtime, since the effect is long lasting. Do not take 6 hours before sleep: According to the manufacturer. Taste The opinions on taste were in vastly different ways. As it fortunately is only one flavor (Grape Candy) the choice is easy. Have 4 of 9 testers complained about the taste - "it was too sweet but otherwise okay." In general, we were but we agree that the taste is acceptable and pre-workout supplements, the effect is more significant. We noticed that the taste of Jack3d "Grape Bubblegum" is very similar. 4 out of 5 stars. Craze effect All 9 testers have reported roughly the same. The effect does not come suddenly and run over one (as in Jack3d) but it comes slowly, "surprising" and lasts a long time. Pumping: Craze has given us a pumping want to miss no more. After the warm up sets the blood begins to bubble, and supplies the muscles optimally. The veins appear and one is "ready to go!" Energy and Power: The energy and strength after taking Craze was a mystery to us after the first few days - it was probably just a placebo effect? No! Even after a month was the power and energy from us on a new maximum. Three testers in the test period in a diet and could, despite the reduced carbohydrate intake significantly increased the weights! The mention of Driven Sports mind-muscle connection has made an important contribution, because in the diet can reduce the weight automatically as it is known that power by the reduced intake of carbohydrates is lost. But Craze is the feeling you could tear out trees. Driven Sports Craze is Jack3d in the shadows Focus: The focus of craze is something special, the craze of other pre-workout supplement is different. Unlike Jack3d where sets in suddenly one of tunnel vision like a drug trip feels, is the focus of Craze pleasant, slowly during exercise and maintains a complete workout for long. Crash or Down: After practice one of us a "crash" or Down has had. The atmosphere was still good long after the workout and the next morning there was no depression, fatigue or bad mood. By comparison, Jack3d 1MR and have totally failed in this regard. After taking Jack3d or 1MR one has always been a "down" after a workout and the next morning is a pain Dosage: Dosage of Craze is surprisingly low. We have NEVER used during the testing period more than 2 spoons to achieve a strong effect. And the combination with other supplements is also not necessary. So all in all very money saving! Compared to Jack3d: From Jack3d we needed after a month already 3 spoons, sometimes combined with other pre-workout supplements such as N.O. Xplode - the neatly on the proposed budget. But Craze also solves this problem with confidence. Cost: As mentioned above you need by Craze NEVER more than 2 tablespoons, which has a distinct cost advantage. Also, combining with other supplements do not need - another cost benefit. A box costs 39.90 $ Craze One serving, so a spoon will cost $ 0.88 The box contains 45 servings Since it takes more than 2 spoons will be the highest Once again an unbeatable range of Suppway.de! USP Labs Jack3d is a pre-workout supplement because of its highly touted highly motivating and training focus-enhancing effect. A report on Jack3d can be found here. USP Labs Jack3d for only 24,90 EUR! What can I say? Access while supplies last! The offer is only available until 03/31/12! USP Labs Jack3d - The world's # 1 Training Booster from the USA! Jack3d is a powerful, sophisticated pre-workout formula that only contains active ingredients that increase the motivation and strength training to maximize training intensity and the pump and a means of stimulating muscle growth. In developing the formula was USPlabs Jack3d disclaims any unnecessary ingredients such as maltodextrin. This is not a formula that contains a variety of substances in quantities absolutely ineffective mini, as in most other vendors is the case. So far evodrene has been a pretty good pre workout. Even though its in a pill form i'm finding that i still get everything that i'm looking for. The only problem is that i have to add some kind of maltodextrin to it so that i get some sugar. I was a little afraid to take a pre workout because of all the effect I heard it can have. So far the only effects I've seen are results. EvoDrene is REDICULOUS! I've been suffering with the jitters since I started taking Jack3D but EvoDrene delivers without making me feel wierd.